As a child who loved math, Mary Cahill was steered toward accounting — "No one knew what to do with me," she recalls. Now Cahill serves as Emory's vice president of investments and chief investment officer, managing a strong, diversified portfolio that helps keep Emory competitive among the nation’s elite universities. Focus: Oversees investments of all endowment, trust, operating and employee benefit funds of the University and related medical facilities. 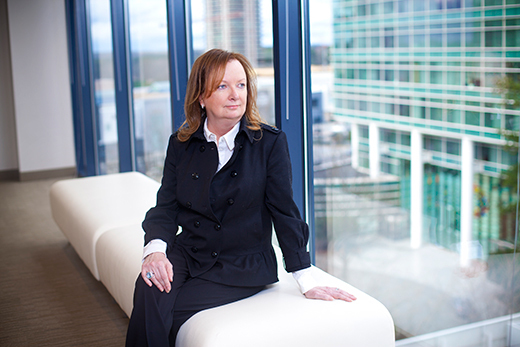 As Emory’s vice president of investments and chief investment officer, Mary Cahill is a perpetual gleaner of data — international investment trends and stock market gyrations, credit ratings and global economic fluctuations, and nearly everything in between. For Cahill, tracking economic fluctuations — and anticipating long-term investment opportunities — is part of managing a strong, diversified portfolio, which helps keep Emory competitive among the nation’s elite universities. As of June 30, 2015, Emory’s endowment value reached more than $6.7 billion. It’s a role she first stepped into at Emory 15 years ago, although her experience with investments stretches back some 35 years. Today, Cahill leads Emory Investment Management, a 25-member investment management team that she built from the ground up. Emory Report caught up with her to talk about the rewards and challenges of her job, and what keeps her confident during stormy economic times. How were you drawn to a career in investment and finance? When I was a kid growing up in New Jersey, my best scores in school were always in math. No one knew what to do with me. My parents thought I should study accounting. Out of college, I found myself working for a company as an assistant credit manager, writing credit recommendations for global clients. From there, I moved into helping manage pension investments. What was it about the work that you found appealing? It changes every day. There is constant learning. It’s not finite, like accounting, where you learn the rules and you’re done. This was much more analytical, a lot of research and a lot of reading. It required an understanding of economics, and I was someone who needed to be constantly challenged — I still do. It was also a field that I could advance in more easily. If you were knowledgeable, people wanted you at the table. For those who may not know, how does a university endowment work? It’s not a savings account that you can pull money out of — every dollar is typically assigned. It works like this: A donor may wish to give a gift to establish, let’s say, an endowed scholarship. That’s a restricted gift with a restricted purpose. The University invests that money, along with other gifts, so that each year the earnings on that initial gift provide a payout for a scholarship. Most endowments consist of a majority of restricted gifts. How do you handle the pressure that comes with managing other people’s money? I just like the challenge. There are days when I’m not too happy because the market isn’t happy. I can feel that probably more than I’d like to. But the other side of that is the great satisfaction you feel when the portfolio is doing well and I’m meeting our objectives and providing support to the University in a real way. What drives you in your work? Most of us who do this work have to make a decision: Do I want to go to Wall Street and become wealthy or do I want to manage money in a way that is giving back, meeting some mission that I can agree with and believe in? If you are driven solely by wealth, then you are fine with creating products that you can sell. But if you’re driven by the intellectual side of investing, this is a fun way to do it. You’ve helped guide the University endowment through some tough economic times. What helped you stay the course? Most important was staying calm; second to that was keeping others calm. A few years ago there was a lot of concern about where the world was going and if the markets would come back. I communicated more during that time than I have before or since, keeping the investment community up to date, finding ways to not let assets get into trouble. For example, we pulled a lot of our collateral and put it into Treasury bills to make sure there wasn’t anything that would really hurt us in our collateral accounts. We also paid attention to our liquidity, which a lot of universities had trouble with. Part of coming out of that crisis was having the nerve to go back into the market. We did and made some investments that had huge returns in 2009. In the end, it was a lot of communication and education and, frankly, sleepless nights. How important is growth of philanthropic support to Emory’s long-term goals? Very important. The gift flows that you can count on year-after-year provide a tremendous financial foundation for the University and make it easier to work through tough times. Beyond the spreadsheet, what are your personal measures of success? Working with this team, seeing individuals grow and knowing that the work they’re doing is satisfying. Also, I get to meet some of the smartest people in the world as I travel and talk to investment managers. I like the big picture stuff and talking to people who think about such things. If the trustees and the president are happy with the results, that always feels good. What might people be surprised to know about you? For the past three years, I’ve served on the investment committee for the NCAA, which is fun. I also help out on the board and the investment committee for the Woodruff Arts Center and the Robert Toigo Foundation. I have a strong interest in bringing more diversity into the financial world, particularly for women, which is not always easily done.